Larry Dahlberg designed this flashy streamer to take Smallmouth Bass when he was a young guide in Minnesota. 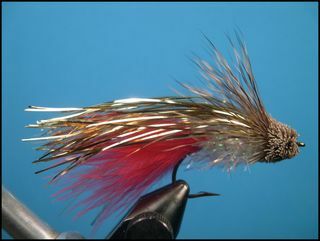 According to Stewart and Allen in their landmark book, "Flies for Bass and Panfish", Larry Dahlberg designed the Flash Dancer as a teenager for old ladies and little kids to use at a fly fishing only Smallmouth Camp where he was a guide. During those years of guiding it proved to be more productive than the other flies he was using. I'm always searching for streamers to take "smallies" on my favorite Northeast Iowa smallmouth streams so I decided to tie up a bunch this winter to try next summer. I'll give you a report next fall in the "photo album" section if the Flash Dancer was as effective for me as it apparently was for Larry and the little old ladies and kids he was guiding. 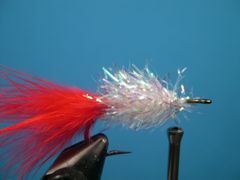 The origindal Flash Dancer had a white chenille body but that was long before the tinsel chenilles came on the market. Since it's called the Flash Dancer I decided to replace the white chenille with opalescent Estaz to give it even more flash. 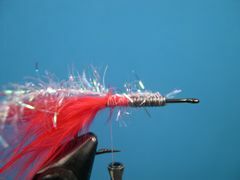 I think the Estaz body looks better on this little streamer than the old fashioned chenille. 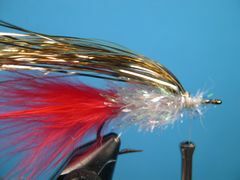 If you can make the head on a Muddler Minnow you will have no trouble making the head and collar on the Flash Dancer. Just remember to stack the deer hair tips for the collar directly on top of the windings for the wing or you may not have enough room to make a good looking deer hair head. Lead wire for weight on the Flash Dancer is optional. 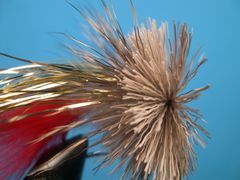 The original did not have any weight, probably because it was fished in lakes, but I'm going to be fishing it in streams in two to four feet of water, or more, so I want the fly to sink quickly. The Flash Dancer in the tying sequence ends up being two-inches long but you can make your Flash Dancer longer simply by lengthing the tail and the wing. I have never fished the Flash Dancer so I can't tell you how I will fish it until I do. I will add more info after I have given it a try. Clamp the hook in the vice, crimp the barb, and lay down a base of thread from 3/16" behind the hook's eye back to the hook's bend. Put several wraps of lead wire on the hook's shank ending at the front of the thread wraps. 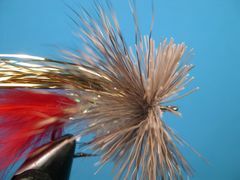 Tie in a Marabou plume that is one and one-half times the length of the hook. 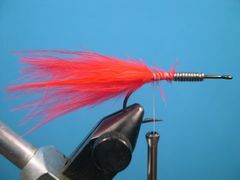 Bind down a 6-inch piece of Estaz from the front of the lead wraps back to the base of the Marabou tail. Wrap the Estaz forward and bind it down on top of the last wrap of lead wire. Trim the excess. Remember to stroke back the Estaz fibers from the previous wrap with the fingers of your left hand as you make the next wrap with your right hand. If you don't, you probably will bind down some of the fibers from the previous wrap. You don't want to do that! Slightly trim the Estaz body so that the belly is fairly flat and the sides are slightly tapered back to the tail. Tie in about 40 strands of Flashabou directly on top of the thread windings. The Flashabou wing should be slightly longer than the Marabou tail. It's a good idea to bind down 20 strands of Flashabou with half of it extending to to the rear of the tie in point and half extending forward. Then fold the forward strands over the rear strands and bind the Flashabou down. Finally, trim the Flashabou wing to length. Clip a Malted Milk straw sized clump of deer hair from the hide, remove the underfur with a comb, and even the deer hair tips in a hair stacker. Trim the butts of the hair clump, measure the tips against the hook and stack the clump directly on top of the existing thread wraps. The tips should extend to the hook's bend. 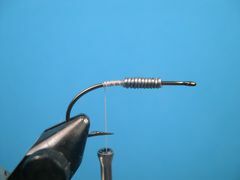 Without moving the thread, stack another clump of hair tips on the underside of the hook. Move the thread forward to the bare hook shank. Cut a soda straw sized bunch of hair from the hide and comb out the underfur. Spin that clump of deer hair for the head. Pack the hair tightly. You may need an additional clump of hair to fill the hook's shank completely with hair. Remove the fly from the vice and trim the head to shape with the help of a double-edged razor blade and a pair of serriated curved scissors. Trim the deer hair collar so that the only hair tips that remain are on the top half of the deer hair head. After you are satisfied with the Flash Dancer's hair cut, go fish it.